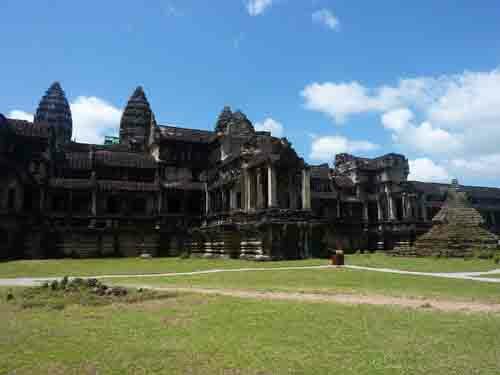 Angkor - the largest religious complex in the world survived to present days. 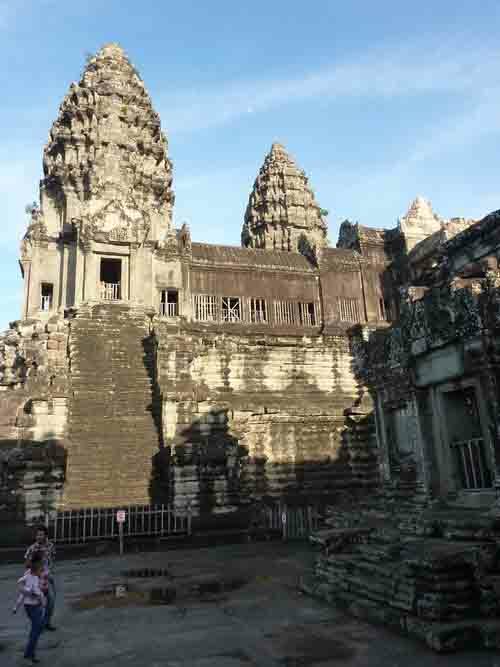 Angkor Wat is the biggest Hindu religious center was originally dedicated to god Vishnu but later became a Buddhist. 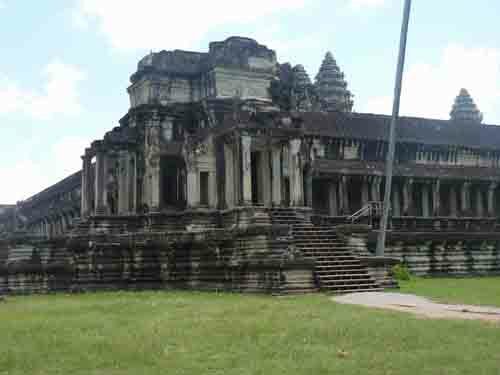 It was located in the south-eastern part of the Yasovarman I city (now the center of Angkor) it was built by King Suryavarmanom II in the early 12th century. 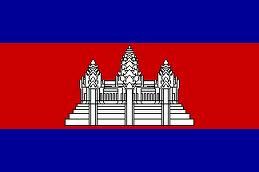 This temple has become a symbol of Cambodia depicted on its national flag. 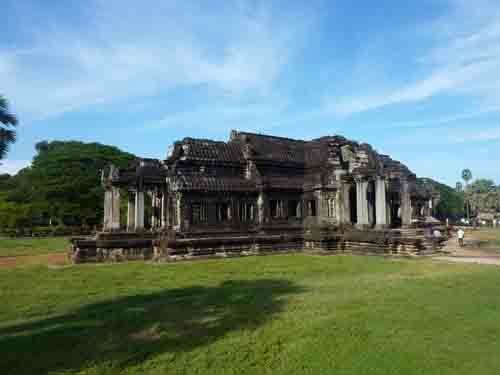 The modern name, Angkor Wat means "City Temple". 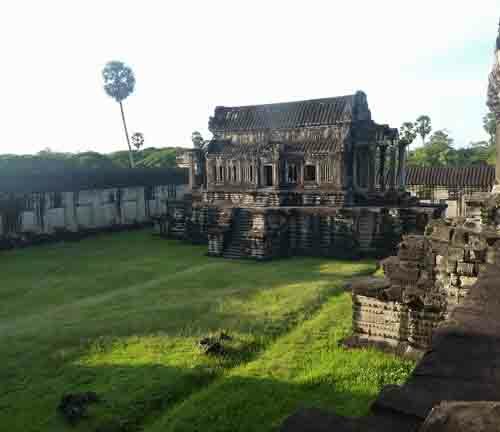 That modern name of the temple perfectly justified because Angkor Wat was the greatest and most exalted of all the Khmer temples but also the city in the truest sense. 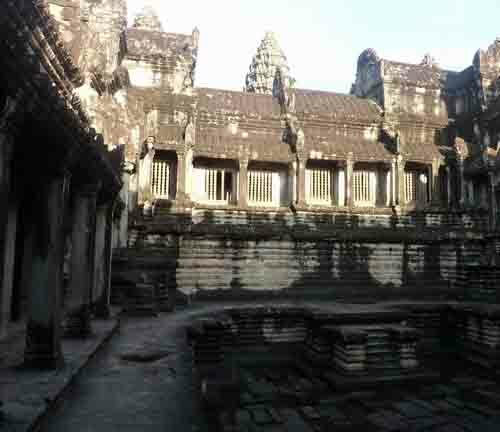 The word "Angkor" is recast of Khmer word នគរ "Nokor" was descended from the Sanskrit word "nagara" meaning capital or city. 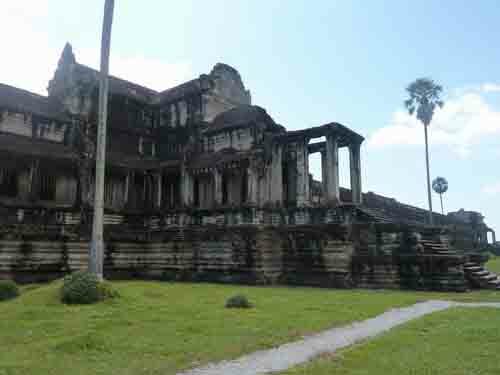 The "Wat" is Khmer word meaning "temple". Because there are no any stela nor any inscriptions regarding the name of the temple as it was then called, and it is not known now it is likely it was called Vrah Visnuloka in honor of the god, which was dedicated. 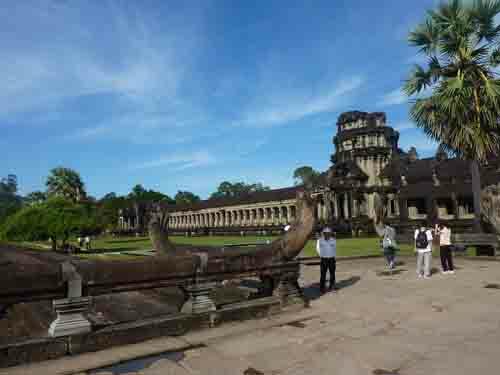 Angkor Wat is surrounded by a moat of 200 meters wide paved with blocks of sandstone. 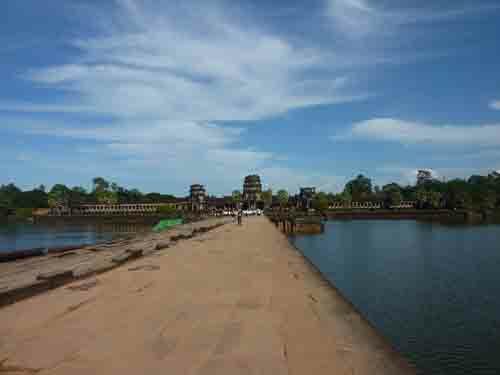 Moat extends for 1500 meters from west to east and to same distance from the north to the south. 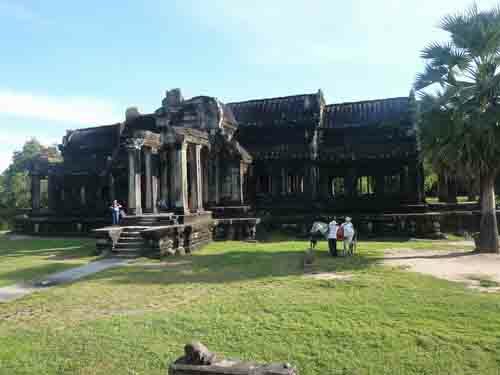 On that almost square "island" surrounded by water Angkor Wat temple covers approximately 21 hectares and is surrounded by a laterite wall. 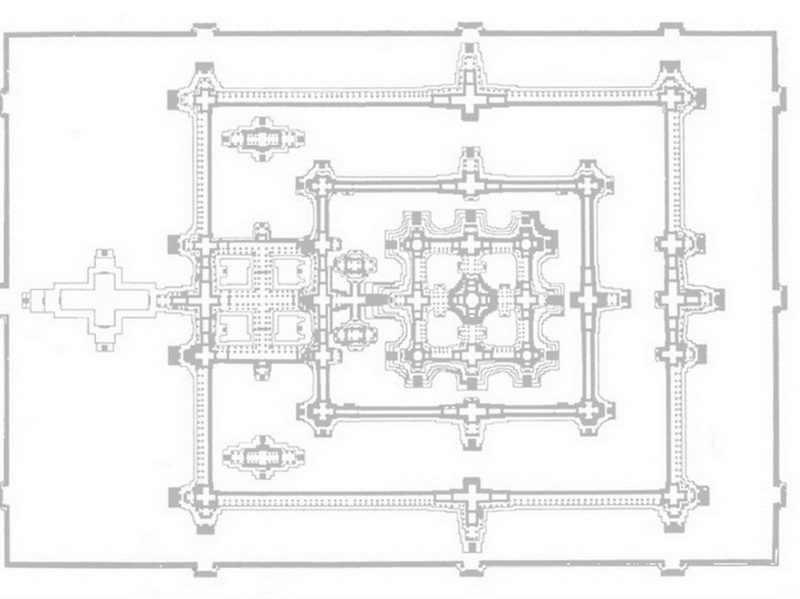 The whole complex consists of a series of concentric rectangular enclosed spaces including three rectangular galleries each towering over the following by open courtyards interconnected crosswise galleries. Walking up the stairs and going through the first of three consecutive rising galleries you will reach the third gallery well known by its bas-reliefs shown on the plan below. Most of these bas-reliefs are magnificent with exception the northeast corner of the gallery which is poorly executed in the sixteenth century. Apart the bas-reliefs in the corner pavilions those bas-reliefs are stretched almost to 700 meters being more than 2 meters longer then longest bas-reliefs in the world. 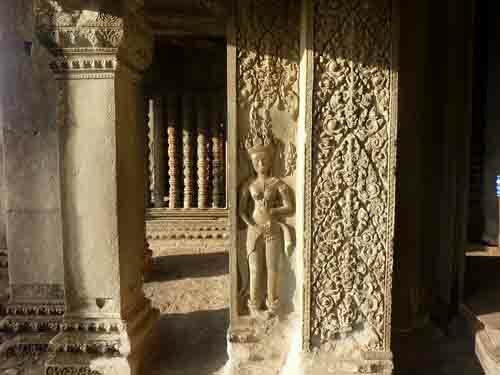 Thousands of figures depict scenes from the Hindu epic Bhagavad Purana in the palaces and the military life at the time of Suryavarman II. 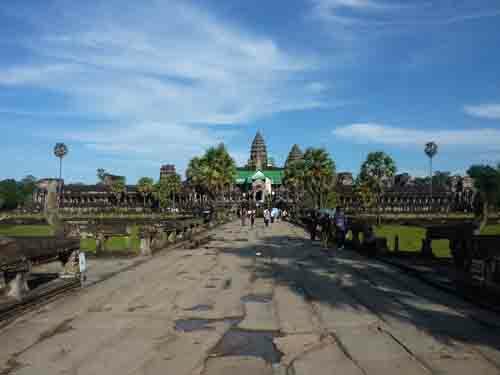 The main entrance of Angkor Wat is from the west built of massive blocks of sandstone wide sidewalk The crusiform terrace on the way of sidewalk is added later to the complex. 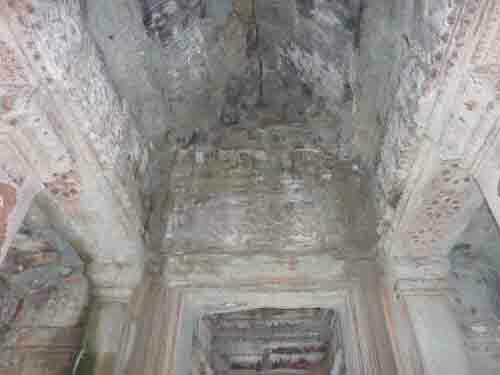 The view to the entrance of the western gopuram with the remains of the three towers opens here. 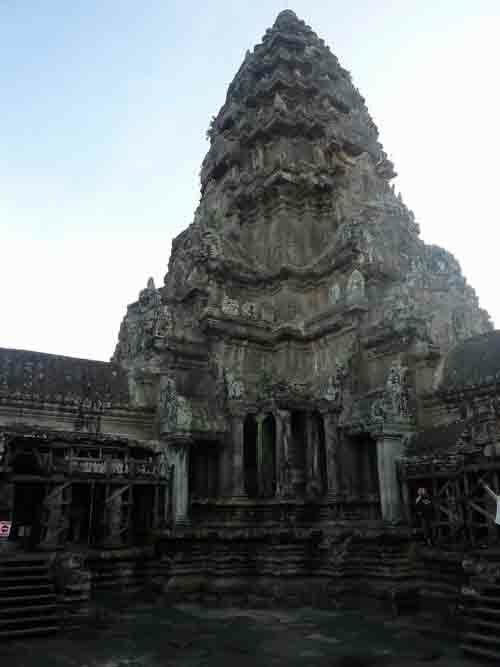 At the present days the entrance to the gopuram is carried through the right tower sanctuary where the octopodiformes statue of Vishnu fills the entire space. 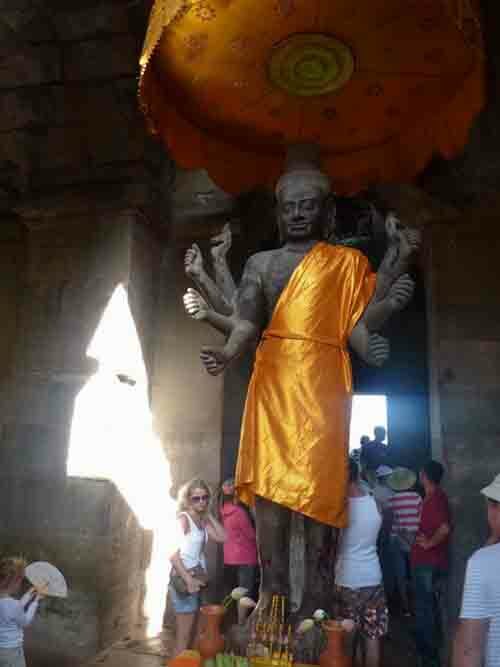 Obviously it is not too much space in the room for this and perhaps this statue initially was at the central sanctuary of Angkor Wat. After going through the gopuram a magnificent view of temple te towers opens at the end of the road. They are surrounded by a glowing silhouette on the morning sky and glowing orange at sunset. 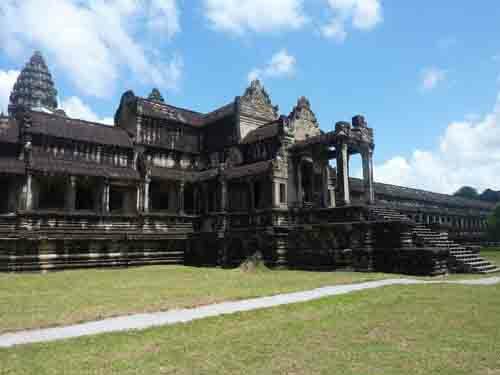 Continuing the way to the temple there is two large buildings so-called "libraries" on both sides with four entrances on each side of the world. 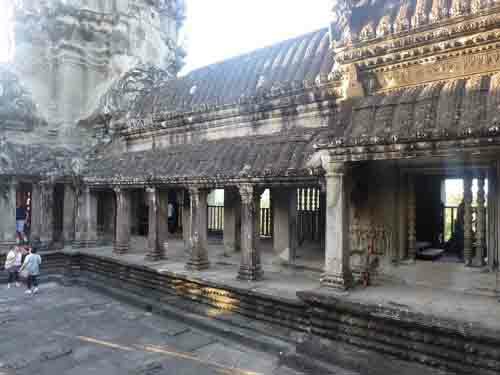 They were the kind of sanctuaries but not warehouses of manuscripts as you can understand from the title "library". Left :"Library"
right "Library". Close to the temple there are two pond digged later at 16th century. Inside you are greeted 1800 apsaras (celestial dancers). Continuing up the stairs to the second level of enclosure from the darkness appears more exciting spectacle - the peaks of the central towers rising out of the courtyard. Footbridge made of the short round the bars built at the second half of the 13th century connects the entrance where we were with a central tower and two "libraries" on both sides. 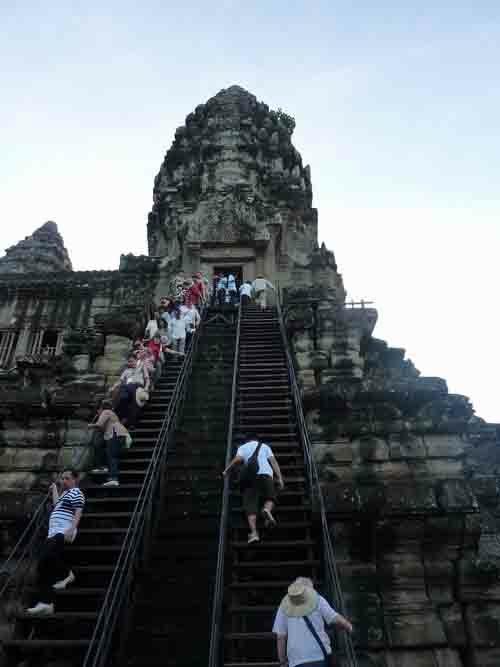 Going up the stone steps to the highest level to the heart of the complex opens view to the huge conical towers located in the middle and corners of a square representing the five peaks of celestial Mount Meru. 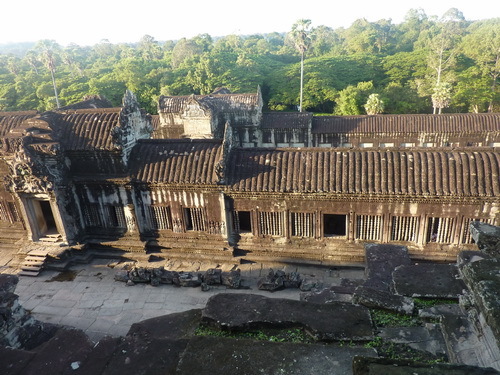 Highest level of Angkor Wat with it's galleries only emphasizes the perfect proportions of the famous towers of Angkor Wat and make a general view an unforgettable. 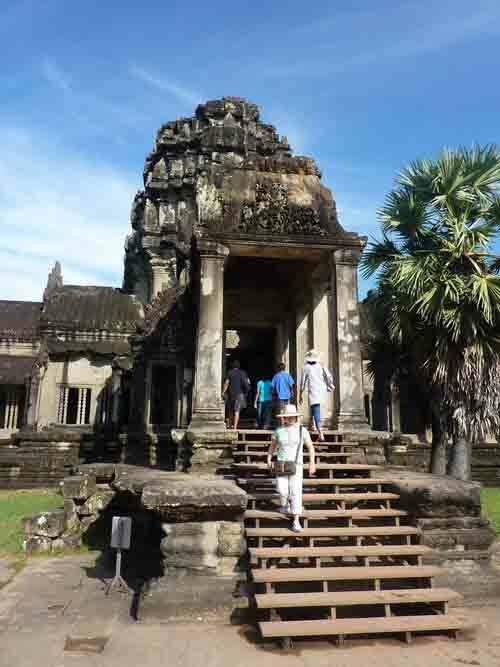 The central tower, or the altar was the abode of Vishnu, because Angkor Wat was originally Vishnuit temple and only in recent days turned into a Buddhist in central sanctuary once stood a statue of Vishnu perhaps the one that now stands at the entrance to the western gopuram. 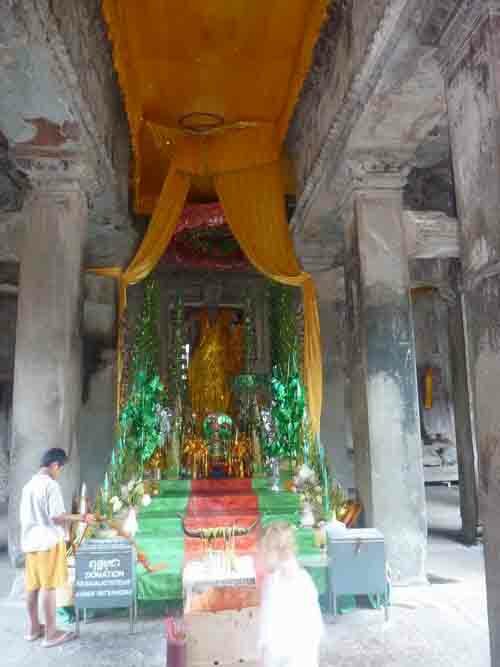 In Cambodia, there was an ancient custom to make offerings to God in the form of gold sheets or small gems that were left in the recess below the statue of the god. 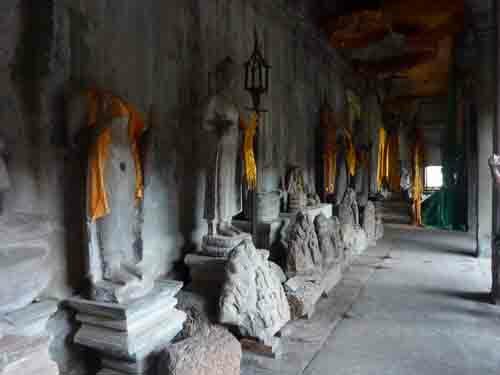 Over the centuries these offerings have been looted. Today only some part of statues of Buddha exhibited in the southern part of the galleries. 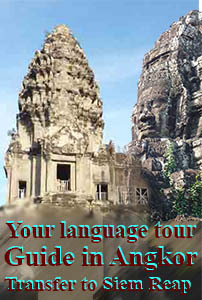 Big standing Buddha still is the object of worship of local and Asian visitors. 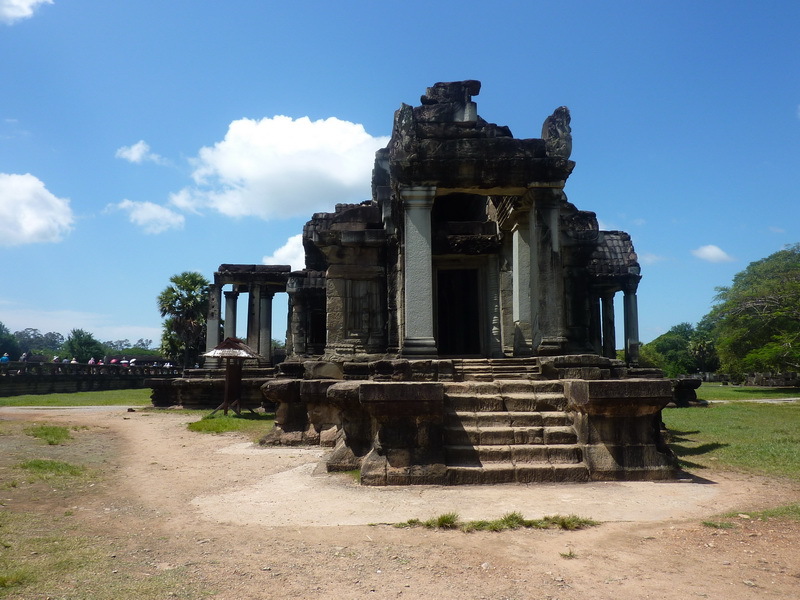 Ornaments of columns, lintels, connectors, as well as Khmer method to make of vaults. The method is called "cantilever masonry" : the stones on the both sides are masoned with a shift until will converge in the middle.